"Yet there is another nature, which is eternal and is transcendental to this manifested and unmanifested matter. It is supreme and is never annihilated. When all in this world is annihilated, that part remains as it is." "In the spiritual sky, the effulgence of Brahman is spread all around, and the whole system is dazzling in spiritual light." "Just as there are many hundreds of thousands of higher planets above this earth, so there are many millions and billions of spiritual planets belonging to the spiritual sky." "Everywhere there are different grades of living entities—in aquatic animals, in the plants and trees, in the reptiles and insects, in birds and beasts and in the civilized and uncivilized human forms of life. 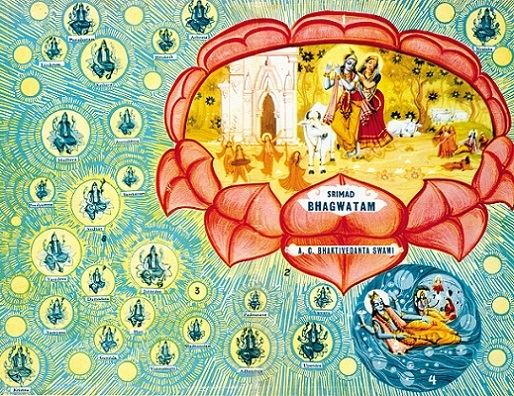 Above the human form of life there are demigods, Cāraṇas and Siddhas on up to Brahmaloka, where Lord Brahmā lives, and among these demigods there are always different grades of knowledge. But past this material world, in the spiritual sky, everyone is in full knowledge, and therefore all the living entities there are engaged in devotional service to the Lord, either in the Vaikuṇṭha planets or in Kṛṣṇaloka." "Amongst all of the planets in the spiritual sky there is one supreme planet called Goloka Vṛndāvana, which is the original planet in the abode of the original Personality of Godhead Śrī Kṛṣṇa. All of this information is given in Bhagavad-gītā, and we are given through its instruction information how to leave the material world and begin a truly blissful life in the spiritual sky." "By the grace of God, we have complete freedom. Because the Lord is kind to us, we can live anywhere—either in the spiritual sky or in the material sky, upon whichever planet we desire. However, misuse of this freedom causes one to fall down into the material world and suffer the threefold miseries of conditioned life. The living of a miserable life in the material world by dint of the soul's choice is nicely illustrated by Milton in Paradise Lost. Similarly, by choice the soul can regain paradise and return home, back to Godhead." "So in the spiritual sky, the land is spiritual, the tree is spiritual, the fruit is spiritual, the flower is spiritual, the water is spiritual, the servant is spiritual, the friend is spiritual, the Lord is spiritual and His associates are spiritual. Everything. Therefore oneness, Absolute Truth, everything absolute. Although there are varieties, these varieties, the spiritual varieties, are simply reflection in this material world. Just like there is a tree on the bank of the river. That is reflected in the water. But reflected how? The top has gone down. The topmost thing has gone down. So this material world is the reflection of the spiritual world—but perverted reflection." "In the spiritual sky you will find happiness, real happiness. In the material sky there is no happiness. How it can be happiness, because the four things are there, janma-mṛtyu-jarā-vyādhi (BG 13.9)? If you think it is happiness in spite of your death, then you are a fool. You do not want to be a dead man, but you are forced to accept death. You do not want to become old man, but you are forced to accept. And these things, if you accept— happiness—that is your foolishness. Vyādhi. Jarā-vyādhi, disease. If you are constantly suffering from various types of diseases and if you think you are happy, that is another foolishness. Therefore Bhāgavata says, parābhavas tāvad abodha-jāto yāvan na jijñāsata ātma-tattvam, that 'All the foolish persons who are born foolish, all their activities are defeat for them unless they are enlightened to inquire about ātma-tattvam.'" "If we want to penetrate the outer space, we should be able to penetrate this outer space or this covering, then enter into that spiritual sky, and there it is called paramāṁ gatim. That sort of journey is called supreme. Not that you go up 25,000 away from this planet and again come back. This is not very heroism. Oh, you should have to penetrate the whole material space and then penetrate the cover and then reach the real sky. Yes. And that information is here also in the Bhagavad-gītā. Paramāṁ gatim. That is the superior journey. That you cannot do with your tiny sputniks. It is not possible. That you have to do by Kṛṣṇa consciousness. Sadā tad-bhāva-bhāvitaḥ (BG 8.6). One who always absorbed in Kṛṣṇa consciousness, and if by fortune at the time of death he thinks of Kṛṣṇa, he is at once transferred within a second. That is the process." "Generally, ordinary persons are engaged simply in working hard in the material world, and they have no information that there is another kingdom or another sky, which is known as the spiritual sky, where life is eternal, blissful and full of knowledge. As it is stated in the Bhagavad-gītā, a person returning to that spiritual sky never returns to this material world of death and suffering." 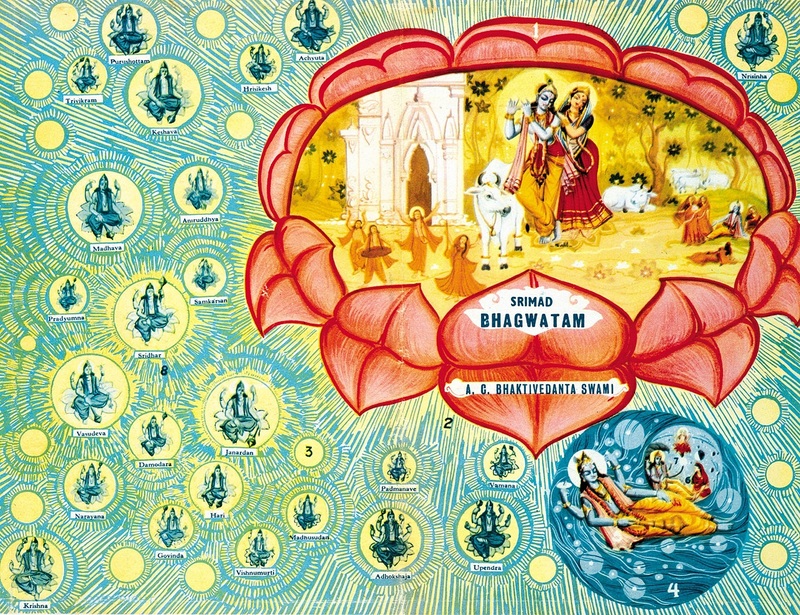 "The Bhagavad-gītā also confirms that beyond the material sky there is another, eternal, spiritual sky, where everything is eternally existing. Direct knowledge of the spiritual sky can be had only by great sages and saintly persons who have already surpassed the influence of the three material modes of nature by engaging in devotional service, or Kṛṣṇa consciousness. Unless one is constantly situated on that transcendental platform, it is not possible to understand the spiritual nature." "It is very much regrettable that unfortunate people do not discuss the description of the Vaikuṇṭha planets but engage in topics which are unworthy to hear and which bewilder one's intelligence. Those who give up the topics of Vaikuṇṭha and take to talk of the material world are thrown into the darkest region of ignorance." "Beyond this material nature there is another spiritual nature. So we do not know what is the formation of this material nature, and what to know about the spiritual nature. Then you have to hear from Kṛṣṇa who lives there. Otherwise you remain nonsense all your life. Here is the information. How can you know which you do not, cannot reach, cannot know - your senses are so imperfect. How can you know? Simply you have to hear. Just like you have to hear about your father from the mother. There is no other way. The father certifies, mother certifies, 'Here is your father, you have to accept.' You cannot make any experiment. Beyond your means. Similarly, if you want to learn about the spiritual sky and God's kingdom, then you have to simply hear from the authority. There is no question of experimental knowledge. Simply hearing. So hearing means, just like you have to believe some gentleman as your father, hearing from the authority of your mother. Simply from the Vedic literature which is accepted as the mother, authority of mother, knowledge. Mother authority. Veda-mātā. It is called Veda-mātā. Veda means knowledge and it is received from the mother. So Veda-mātā, the knowledge mother, you have to know what is Kṛṣṇa. And here Kṛṣṇa is personally explaining. So you have to believe it. Then you get the knowledge. Otherwise there is no possibility. You cannot make any experiment. Then you’ll fail." "Of course, it is not possible to explain what is the spiritual world from the material world, but from the śāstra... Just like you read geography. If you want to go to India, you get some idea that 'India is like this. The shape is like this, the climate is like this, the people are like that.' So you simply get an idea. But actual experience you'll get when you go to India. Similarly, the, we have got all these explanation in the śāstras what is that spiritual world, but we cannot conceive at the present moment the spiritual world. But you can conceive it. When you are advanced in Kṛṣṇa consciousness, then you'll be able. Because everything will be revealed." "A person in Kṛṣṇa consciousness has no fear because by his activities he is sure to go back to the spiritual sky, back home, back to Godhead. Therefore his future is very bright."